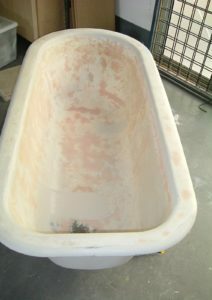 Why do baths need to be Resurfaced? Like any surface, the surface of a bath will wear out over years of use and cleaning, leaving it porous. Once a bath is old and worn, the surface becomes rough and traps dirt, making it difficult to keep clean. When scrubbing is required to clean the bath, this issue will only become worse. Resurfacing is the perfect solution to extend the life of bathroom tiles and fittings. After masking the surrounds to protect any surfaces not being sprayed, the bath is primed and Resurfaced. Most commonly, baths are Resurfaced with a High Gloss White, but other finishes and colours are available. Our coating dries in only 2 hours. To finish, the masking is removed and a new bead of silicone applied. 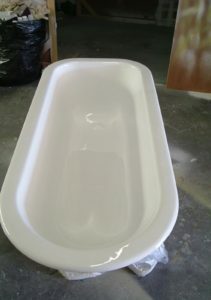 The bath is ready to be used once the silicone is set. Resurfacing comes with an adhesion warranty and will last for years with care. Care and maintenance is simply non-abrasive cleaning, using a detergent cleaner with a soft cloth, so your bath will no longer be soul crushing to clean. 😊 Please contact Resurfacing Australia to find your local Resurfacer. To find your local Resurfacer, please contact us today and we will refer you. Just like going to the hair dresser to get a new colour or a cut, Resurfacing can make your kitchen look refreshed again. 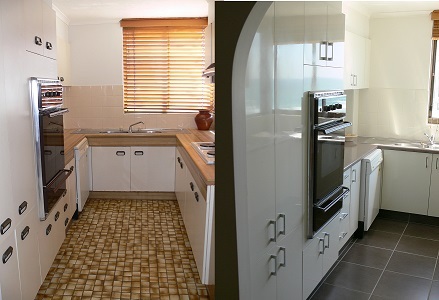 All kitchens start out new, and after 10 years or more, they need a little help to be rejuvenated. 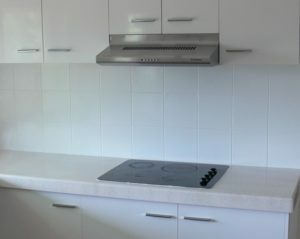 This does not have to be difficult or expensive, and Resurfacing Australia has the perfect solution. By Resurfacing the bench top with a faux granite finish, you will give your old bench a brand new stone look. Then, with our specialty coating tinted with your choice of colour from the Dulux range, your cabinets can be Resurfaced in a finish of High Gloss, Satin or Matte. As part of our preparation, we remove old silicone, clean, fill and repair the surfaces so that any underlying damage will be covered by the new Surface. You can even fill the handle holes so you can install a different size handle. Our members are all independent businesses that set their own pricing, but overall, Resurfacing will be about 75% cheaper than replacement. 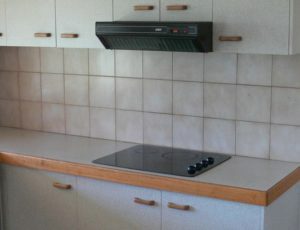 Your quote will be based on the size of the kitchen, the type of substrate that the surface is made of and it’s condition, as well as the area around the kitchen that will need to be protected. Just like a quote from a hair dresser, you can get a quote from your local Resurfacer before deciding if you would like to go head and make your kitchen look gorgeous again. Contact Resurfacing Australia to today and we will refer you to your local Resurfacer.